“Leonardo” is a beautiful Jaguar with an unfortunate history, but fortunately with a much happier future. Born into captivity, this wondrous creature was raised in a cage and trained for the entertainment industry. To make him easier to handle, his canine teeth were pulled as were all of his claws. When his trainers tired of him, they sold him to a small Arizona zoo where he endlessly paced in a 10 x 12 foot cage with little care. Finally, the zoo no longer wanted him and Leonardo eventually found a loving, caring home with Southwest Wildlife Conservation Center in Scottsdale, Arizona. And, that’s where I first encountered him enjoying the late afternoon sunshine. Magnificent is too small a word to describe how regal Leonardo is, and I hope my painting reflects some of his majesty. After completing my painting, I submitted it to the Arizona Art Alliance to be evaluated for exhibit in their “Art in pARTnership II” show. It was juried into the show which opens on October 1 and runs through October 28 at the Holland Gallery of Fine Art in northeast Scottsdale. An artist’s reception is scheduled for Saturday October 8 from 4:30 – 6:30 p.m. I hope you’ll join me for the reception and have the opportunity to meet me and enjoy my painting of Leonardo. Today, Leonardo has complete medical care, a large grassy enclosure and perches to rest on while he watches his world go by. His raw paws have healed, his diet is designed to be eaten without the need for his canine teeth, and short of being truly free in the wild, he lives a life of comfort. For more information on the Arizona Art Alliance and their “Art in pARTnership II” exhibit, visit: http://azartalliance.com/. For directions to the Holland Gallery of Fine art, visit: http://www.azfcf.org/#!directions-and-contact-us/c181j/. For more information on the wonderful work being done at Southwest Wildlife Conservation Center, visit: http://www.southwestwildlife.org/. Leonardo even has his own web page on the site: http://www.southwestwildlife.org/resident_animals/jaguar/. This entry was posted in Events, New Works. Another heartbreaking story of animal cruelty. So great he is finally in good care. He is absolutely gorgeous, and your painting does his majesty and beauty true justice! Stunning work Pam! Yes, it is so good to see him safe and happy now and not being harassed. Thank you. Wow ! What a likeness of a beautiful animal. Nice job on your part. Thanks, it was Tom’s interesting photo that inspired me! The Southwest Wildlife Conservation Center is about 45 minutes from us – it was started about 25-30 years ago and a retired doctor moved next door a few years ago knowing who his neighbor was and this year he tried to close it down because the coyotes & wolves made too much noise!!! Fortunately too many people supported SWCC and his request was denied. All I can say is “BEAUTIFUL”. 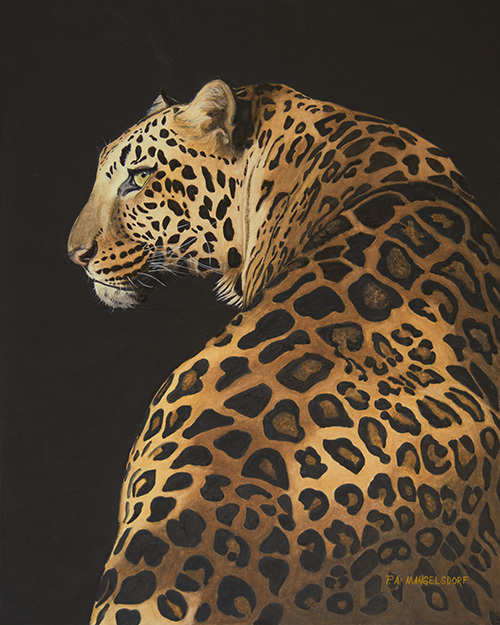 Your work is always wonderful and can capture the animal at its best. Thank you, Terrie – always means a lot coming from you – another watercolorist! Wow, what an awesome Leonardo. Pamela your work is amazing. I just hope you allow some sort of reproduction so I can enjoy Leonardo in my home. I would be happy with note cards.